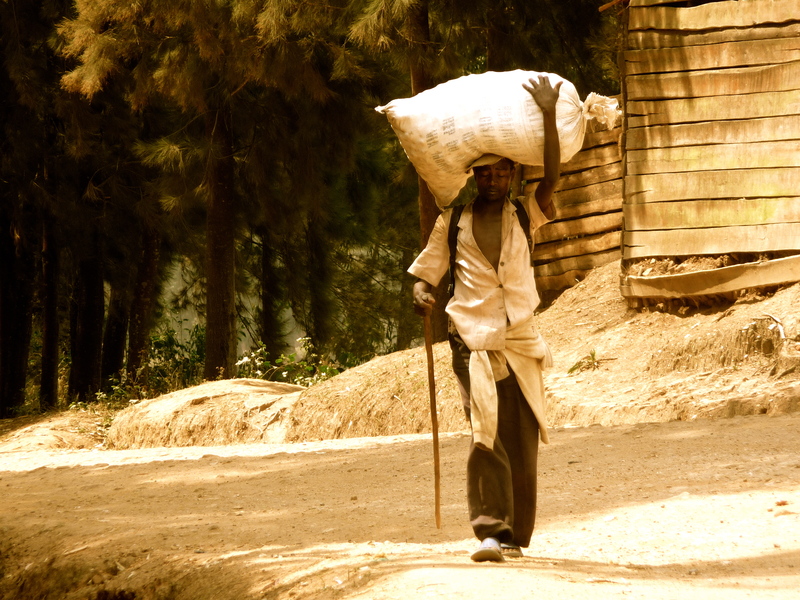 Last time I wrote it was the eve of our Rwandan adventure and now as I sit in Kigali on our last night in Rwanda, it is difficult to get my head around the week we have spent here – never mind to try to put it into words. After an epic 10 hour bus trip that brought us from capital to capital – Kampala to Kigali, we arrived exhausted and exhilarated. The drive through northern Rwanda south to Kigali is spectacular and it was clear to see why this place is called ‘the land of a thousand hills’. I lost count within the first hour. Densely cultivated countryside sprawled across the hills in a patchwork of every kind of green imaginable. Mud huts clung to the edge of steep valleys as women and children carried all kinds of things on their heads around the winding roads. Stacks of terracotta roofing tiles, jerry cans full of water, a spade head, giant bunches of bananas, huge clay pots, two-metre long lengths of sugarcane, an uncountable number of giant sacks of potatoes, a man in a tiny village dressed immaculately in a suit with a briefcase on his head, another man carrying a 4-foot high sack of firewood – sitting vertically on his head… The list goes on. So the first thing that hits you about Rwanda is its overwhelming beauty. However, this is quickly undercut by the unspeakable horror that took place here not so long ago. On day one, Kirsty and I went wandering only to stumble across Hotel des Milles Collines aka Hotel Rwanda. 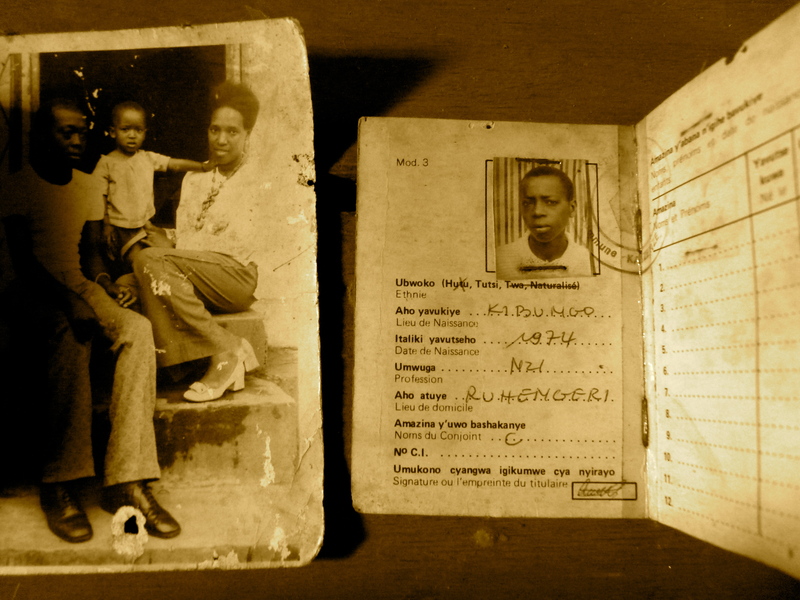 For those of you who haven’t seen the film, it documents a local Rwandan man who managed the hotel and during the genocide gave refuge to over a thousand Tutsis, ultimately saving their lives. We entered the immaculate foyer and ended up in the most beautiful gardens sitting beneath umbrellas sipping coffee. It was hard to try and picture the scene here in 1994 when people lived in constant fear of death and were so desperate they drank the swimming pool to stay alive. The pictures and stories deteriorate into a scene of absolute horror as the genocide takes hold of the country. Over 800,000 Tutsis were murdered in 100 days, a rate of death that I still cannot begin to get my head around. The complete apathy of the international community is chilling; the world literally stood by and watched as people were slaughtered, mostly with machetes, all over the country. People were sending messages to the world, reporters were sending stories to editors but the world was not interested. America had recently been embarrassed by a major blunder in Somalia and didn’t want to get involved again. The press said people were ‘sick of Africa’ and, besides, Princess Diana and Prince Charles were getting divorced – that was what sold papers. I am in the middle of reading an incredible book called “We wish to inform you that tomorrow we will be killed with our families” by Philip Gourevitch, an American journalist who came to Rwanda after the genocide to try and find some answers. 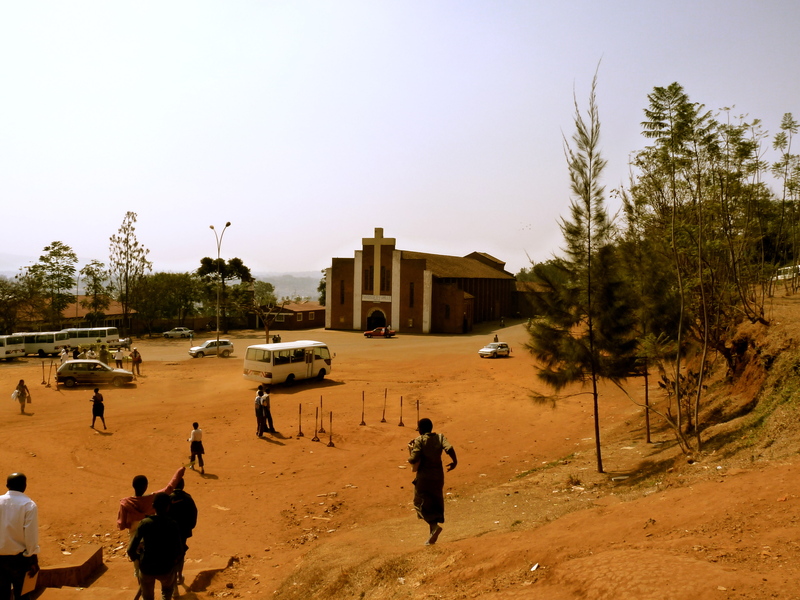 That night, lying in bed, images of horror still fresh in my mind, I read about massacres that took place in a church in Kigali called Sainte Famille. Realisation hit me – we were staying at the Sainte Famille. I lay in bed looking around me, trying to take in stories of thousands hiding in these very rooms as the massacres took place outside the doors. There were lists of names of Tutsis to be killed and the Father of the church actually helped the genocidaires to locate these people from within the church. Needless to say, I did not sleep that night. The following day, we headed out of town, south to a town called Ntarama where yet another unthinkable massacre took place. People had fled to the church for sanctuary, naturally thinking that in a place so sacred as a church they could not be harmed. They were wrong. 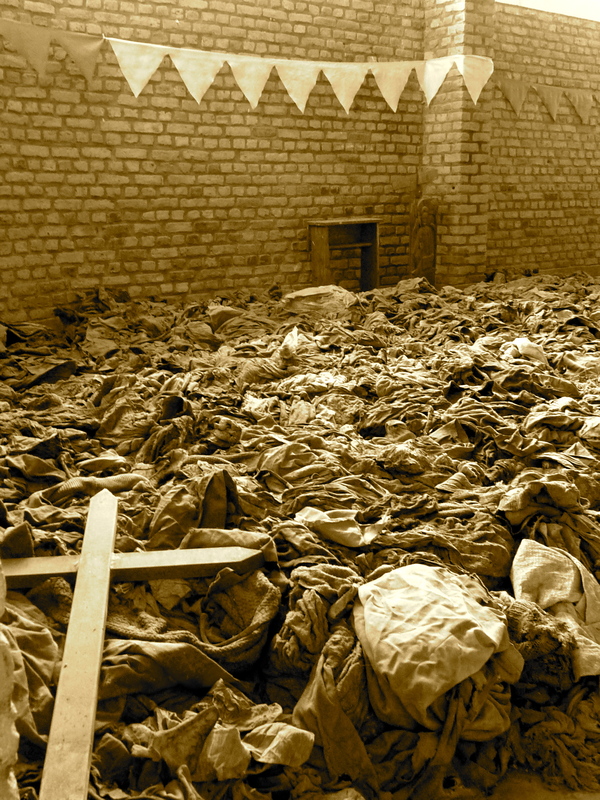 5,000 were killed there in just two days and their clothing, mattresses, cups, bowls, ID cards and Rosary beads remain – not to mention skulls and various bones. It was seriously disturbing and at times I wondered what I was doing there witnessing such horrors. And yet, this is such recent history – it all happened only 15 years ago – and I felt ashamed that, although I was only 11 at the time, I did not know anything about it until much later. To put things into perspective, at the same time as the genocide, OJ Simpson was on trial and the Oklahoma bombings took place. I definitely heard about them. But 800,000 Africans? Nothing. The second church at Nyamata was even more disturbing than the first and I won’t go into details because they continue to haunt me but what was incredible was that the guy showing us around, telling us the stories of horror was there. He was in the church at the time of the massacre. He was only 8 years old. His mother, his brother and his twin were all slaughtered but he survived. 6,800 were killed there over two days and he was one of 7 that survived. His story is unbelievable. The details are atrocious. I became unable to sleep at night, deeply disturbed by the horror of the country’s recent history, looking around me at every face, wondering what their role was in all of this. Basically, anyone here over 15 years of age was somehow involved – they saw their family murdered, they escaped certain death, they were a perpetrator, they watched and did nothing. No one survived unscathed. And yet, Kigali is a modern, thriving city, cleaner than any other I have seen in Africa, with good infrastructure, a remarkably organised public transport system and high rise buildings. It is a city moving forward – which is all they can do. But I couldn’t help but look back with horror. It was time to get out of the city. We jumped on a bus and headed westwards. 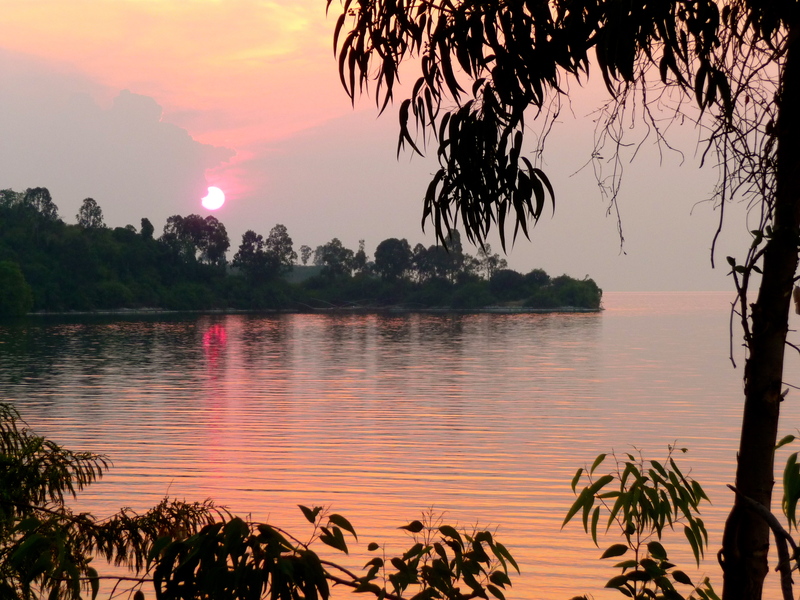 Lake Kivu forms part of the western boundary between Rwanda and the Democratic Republic of Congo and is breathtakingly beautiful. Our bus wove through spectacular hills and we caught glimpses of the lake between valleys, glowing in the light of the setting sun. We arrived at a gorgeous little guest house right on the lake front and made straight for the bar. We sat with cold beers watching the sun, burning orange, as it set over the lake and finally I felt at peace. Somehow, in the midst of all this darkness and unspeakable tragedy, there was beauty. The people here were leaning, however hard it may be, to move on. It was time to start looking around me and appreciating the country for what it had moved on to become. We had an amazing meal of fresh fish sitting right on the lake and watched as little fishing boats cruised the horizon. Back at our guest house, all three of us piled into our one bed – we’re on quite the budget! 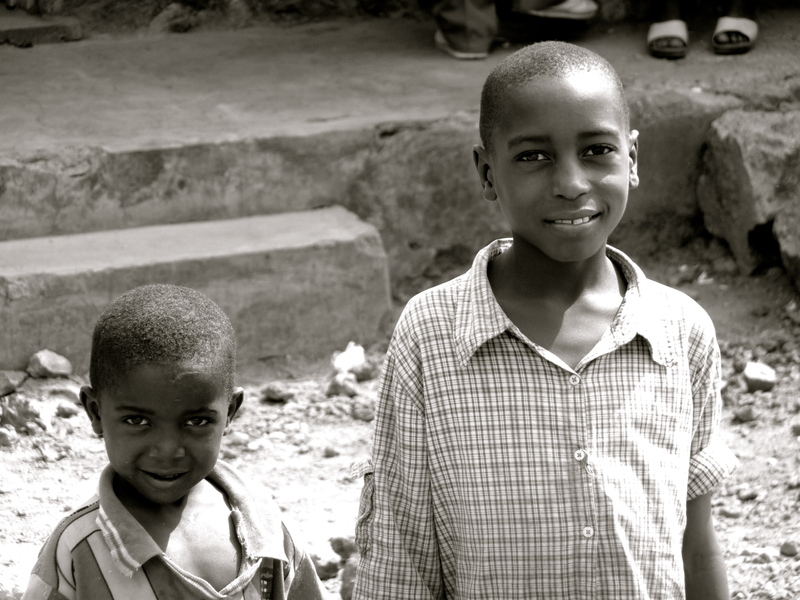 – happy and content at having finally seen another side of Rwanda. The following day we caught another bumpy bus (can you imagine that it could take 4 and a half hours to travel 90 km??) up the lake to Gisenyi. Another place with a dark history – this was where the genocidaires, the perpetrators of the genocide, fled and set up their makeshift base after the genocide, but the beach by the lake was too alluring to continue to dwell on that and I was soon jumping into the lake for my first proper swim in months. It was bliss. Despite the fact that the lake sits on very volcanic land and there is a constant stream of bubbles coming up from the lake bed. Sometimes they can be poisonous and you get asphyxiated but I was told not to worry, it doesn’t happen too often and someone will usually see you and carry you back ashore. Almost bliss. We spent an amazing couple of days catching up, hearing all about his stories of Congo, of being kicked out of Darfur in Sudan when their psychotic president decided to expel all the aid agencies as well as laughing about the flat we once shared worlds away in Wellington. Yesterday we met up with a bunch of his fellow NGO-workers and walked over the hills to an incredibly beautiful little place – appropriately named Paradise. 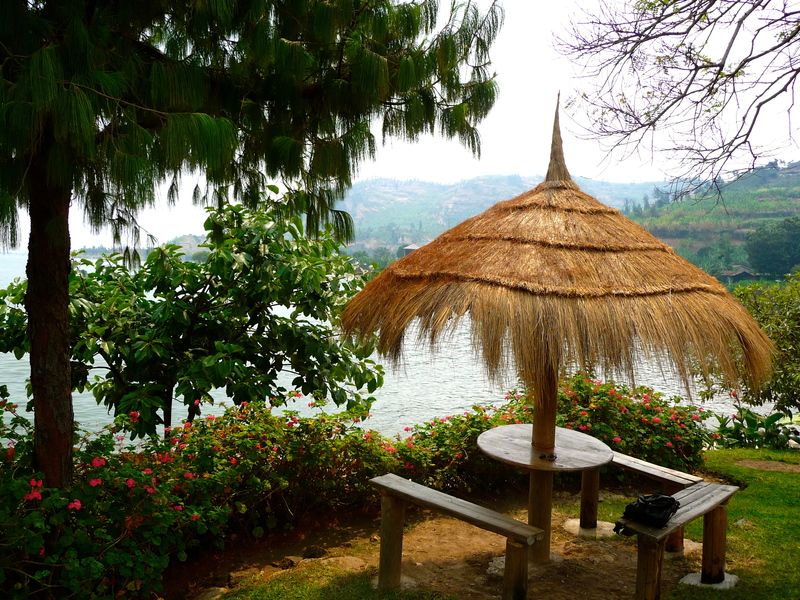 It’s a hotel on the peninsula where we swam, ate great food and watched the sunset over the hills of Congo. Sometimes you just have to pinch yourself. News from KAASO is that building is well underway on the girls’ dormitory now – they have completed all the walls and are now starting on the roof! Dominic is so excited every time I speak to him and I’m looking forward to next time when I can tell him that we have another few thousand to send his way (that’s millions in Ugandan shillings!). Thank you again so very much for your support and messages from around the world. It helps when things get tough here to know that there are so many amazing people out there and that the world, despite the atrocities I’ve been witness to the last week, is still a good place.